Congratulations! The birth of a child is a wonderful event. Parents naturally want to give thanks for the birth of their child and the Church is an obvious place for this to happen. We are only too delighted to explore this celebration with you and the possible desire you may have to raise a child in the Christian faith. The Parish offers a choice of a Thanksgiving Service and / or Child Baptism/Christening. If you would like your child/children to grow up in the Christian faith and be part of the Church then please do contact either the Children & Families Minister or the Vicar. It is not uncommon for people to be baptised as teenagers, as pensioners or somewhere in between; sometimes parents are baptised/christened with their children. If you have not been baptised/christened or would like to reaffirm yourself the promises made when you were baptised/christened as a child then we would be delighted to explore this with you. Please contact the Vicar or other members of the Ministry Team, or pop along to a church service on a Sunday. 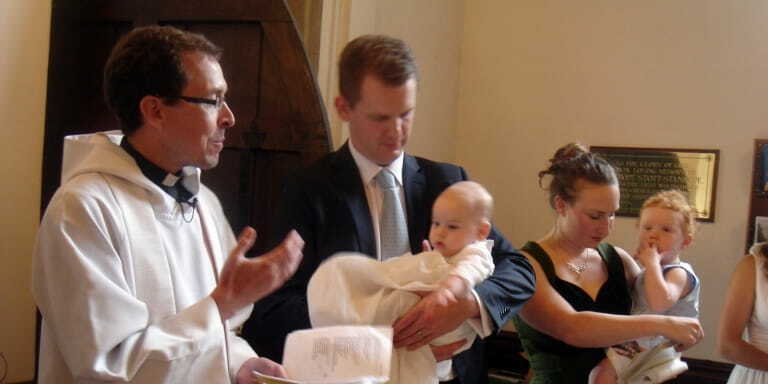 Traditionally a child baptised/christened as a baby would be raised within the life of the church. When old enough the child/adult would receive specific instruction in the Christian faith and would then publicly ‘confirm’ the promises that had been made for them by others at their baptism/christening, thus owning the decision to follow Christ Jesus for themselves. At a confirmation service the candidate declares their faith in Christ Jesus, affirms their baptism vows, and the Bishop lays hands on the individual praying for them to receive the Holy Spirit in order that they might be strengthened and empowered to live out the life of faith. If you have never been confirmed it is a wonderful opportunity to grow in faith. Please contact Vicar David for details.